This past weekend, I had the opportunity of introducing friends, family and local Blues lovers to Ray Goren. 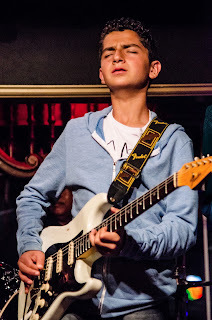 Ray is 13 years old and, as his dad told me, knows that being a Blues musician is what he wants to do in life. At three years of age, Ray started playing the guitar. At nine years old, he saw a video of B.B. King and told his family that he wanted to play like B.B. Well, earlier this year, Ray opened for B.B. King at Monterey's Golden State Theater. And, this past weekend, Ray performed for us all at the Theatre on San Pedro Square in downtown San Jose. Now, not all of us will work in our passion or even want to. But, if we know what we are passionate about and dive into it, that passion will expand our lives. A dear friend of mine gave me a gift with this engraved on it: "May the beauty of what you love be what you do." Your passion may not be the "money making" part of what you do in life, but your life will be more enhanced if you create some space for it. Take time this week to reflect on what you are passionate about and add it into your life or add more of it into your life. You won't regret it!